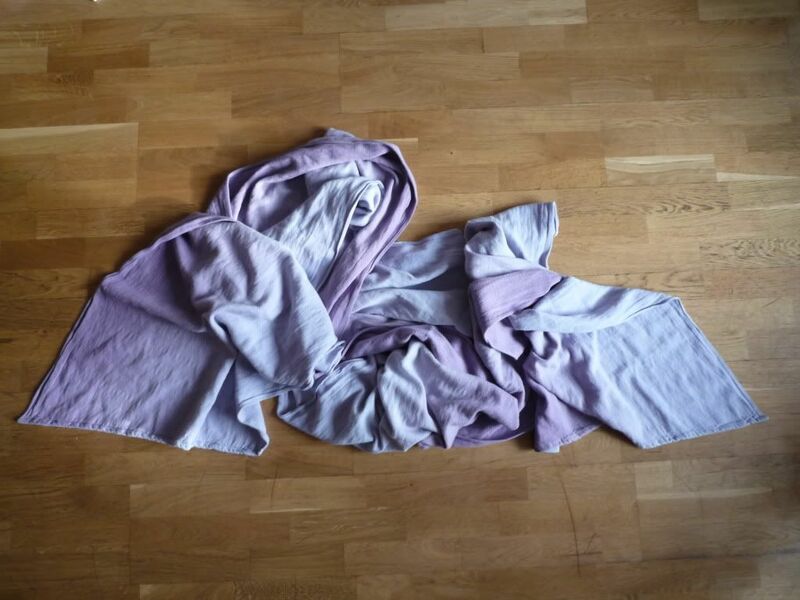 I love having a range of short wraps – they’re great for keeping in the car or your bag (or wearing as a scarf) until you need them, and they don’t suffer from an urge to mop leaves/mud/snow while wrapping on the go. Various links to ways to tie short (size 1-3) wraps at the bottom of this post. 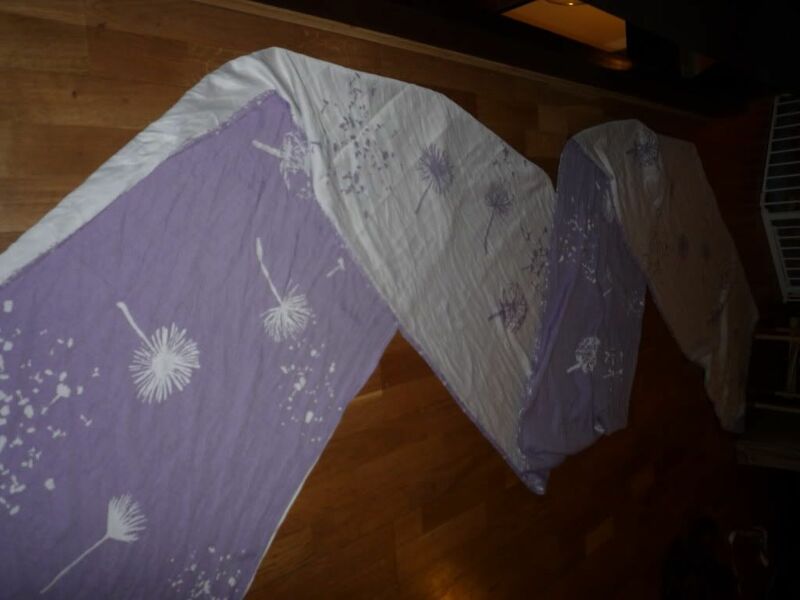 Having shortened and hemmed a few wraps (for just shortening a wrap, I’ve done a new post here: https://itsnotspaghetti.wordpress.com/2010/12/29/shortening-a-wrap/), I decided to tackle my two monsters – a 522cm Natibaby Purple Dandelions, and a humungous 560cm (short size 8!) 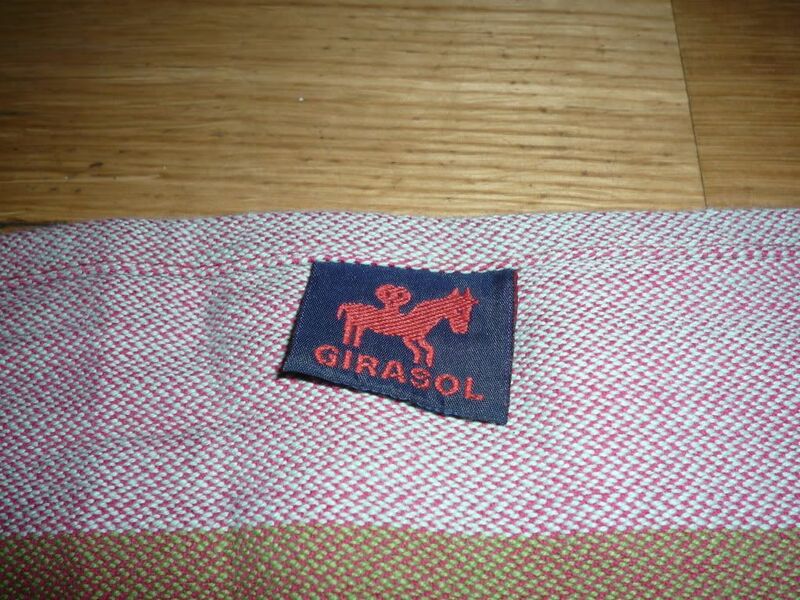 grad-dyed Didymos Hemp Indio. I’d like to chop each wrap to make 2 wrappable-length pieces (so 2 becomes 4!). 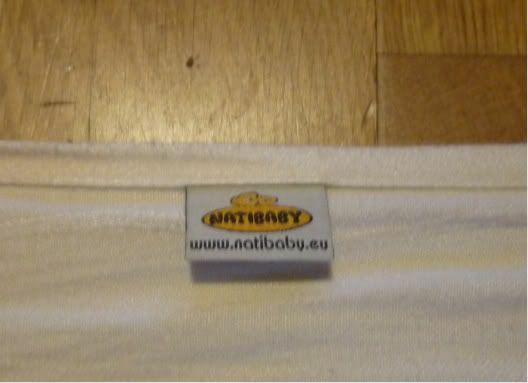 I’m going to show pics for the Nati as it’s slightly more complicated to manage the middle markers in Nati wraps (Didy ones are just stitched on top of the hem, so very easy to remove and replace where you want them). 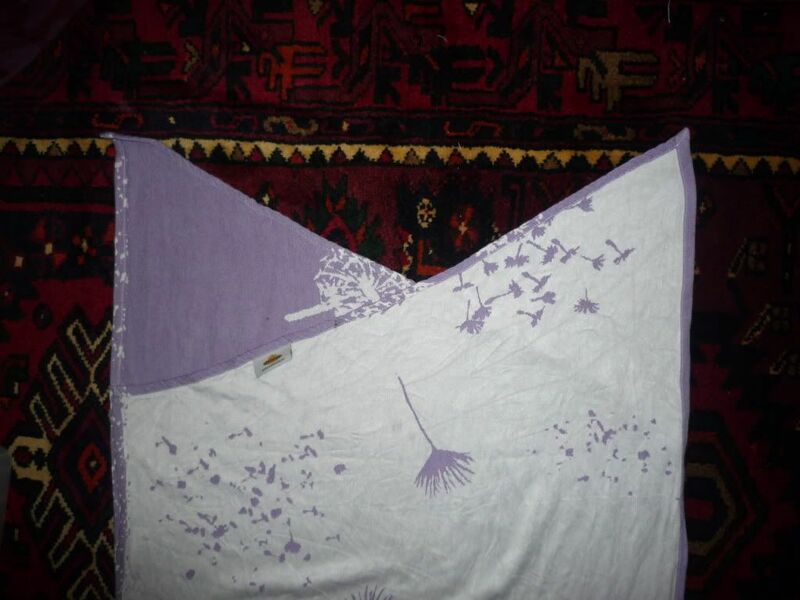 This Nati is a bamboo/cotton blend and quite smooth and slippy; the indio has a lot of occasionally random diagonal stretch, so both need careful measuring, cutting and pinning. This applies to all jaquard/diagonal weave wraps as the diagonal stretch can easily make your cut/hem wonky or uneven. 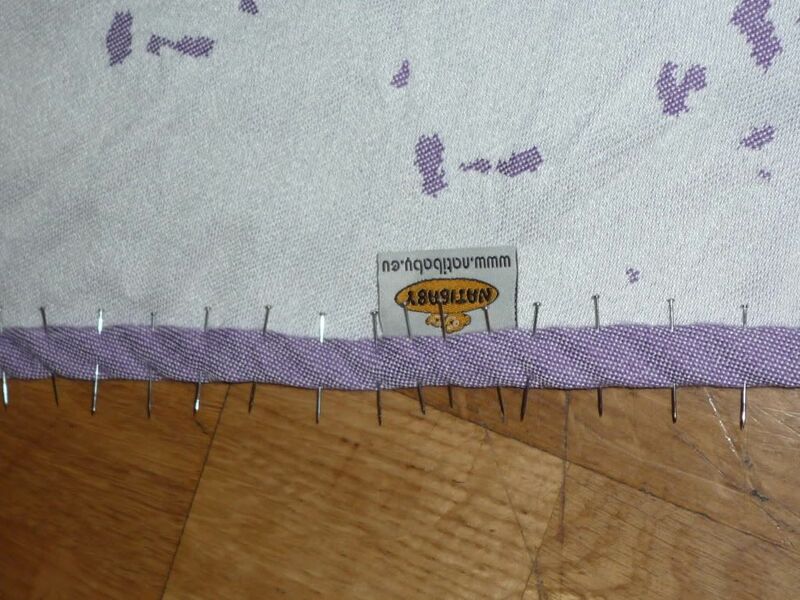 I’d advise measuring at least twice when cutting a wrap – I usually put saftey pins in the hem where I’m thinking of cutting first so that I can try wrapping it to it’s intended new length before I cut. The Nati is going to end up as a size 1 (normally 220cm approx) to use as a no-sew ringsling), and a size 2 (normally 270cm approx) to keep in car/bag for squishy ruck-tied-under-bum wraps. Since the bamboo fabric is quite slippy, I’d like a bit extra for the shorter piece so that it doesn’t slip out of sling rings. So I’m going to cut 235cm from one end. 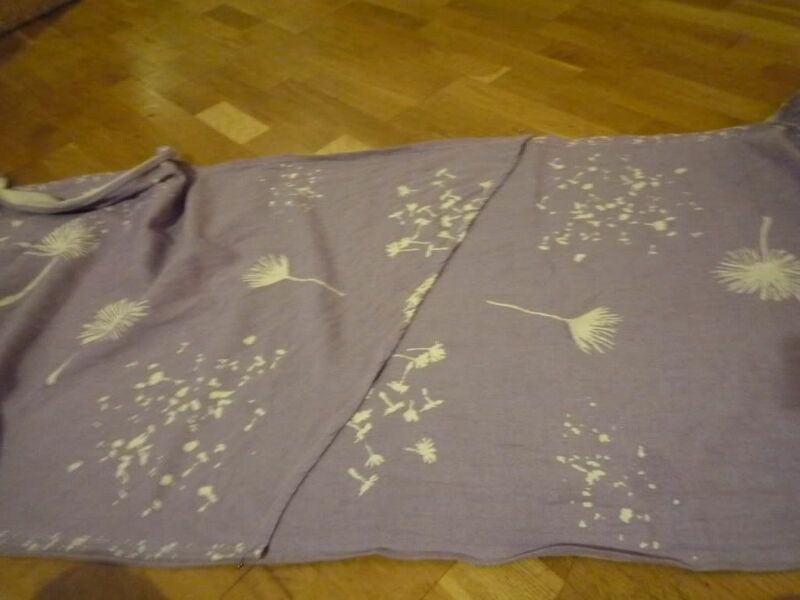 I measured along both the top and bottom rails and used a washable white fabric pencil to mark the 235cm point. I did this at least twice (and will admit that I’ve occasionally measured from both ends and more than 10 times when I’m feeling particularly nervous). I guess you could use anything that’ll mark the fabric to do this since the marks will end up inside the hem and won’t show even if it doesn’t wash out (though avoid felt pens or markers not designed for fabrics that might leech through the fabric when washed). 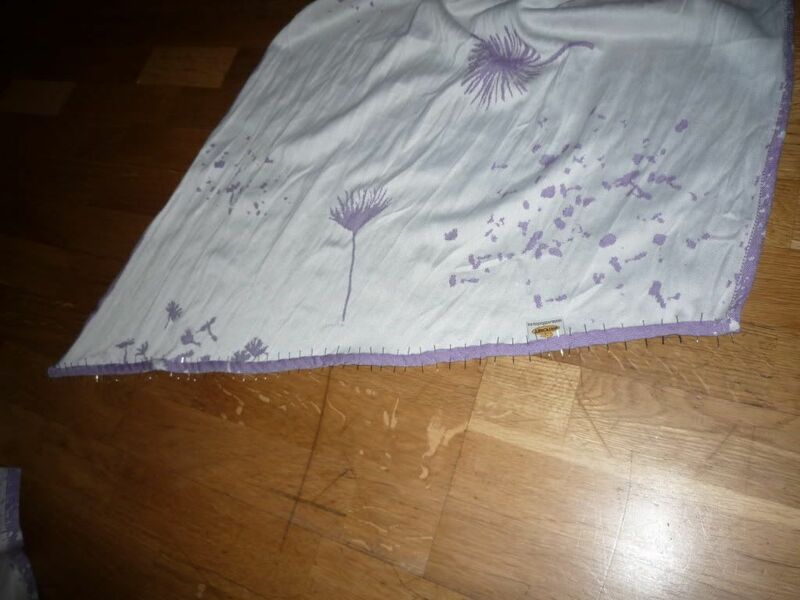 I then folded over one end and pinned it to my marks at the corners to use the original hem as a template. So now you have 2 wraps! 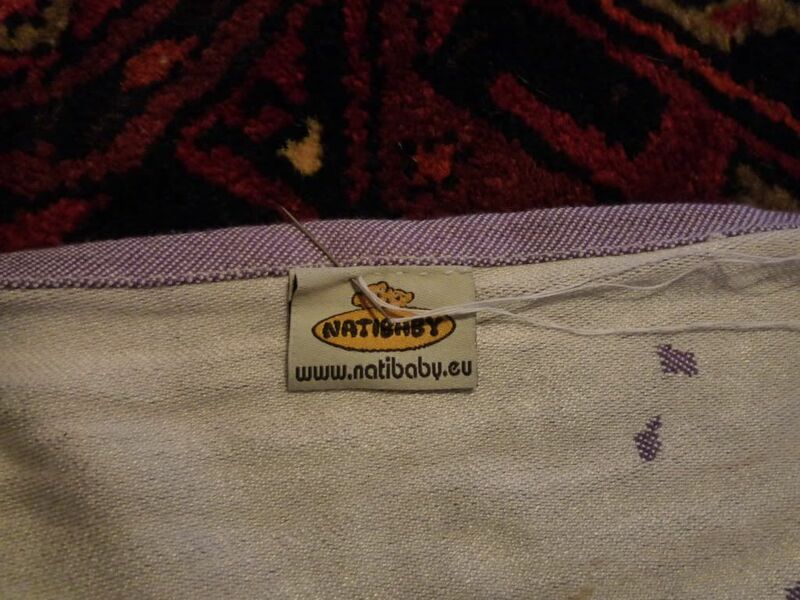 If the wrap you’re chopping is a Natibaby or Girasol the middle markers are sewn into the hem on the rails, which means it can be a pain to move them. I don’t know about all wrap brands, so this may or may not apply – it definitely doesn’t apply to Didys as their markers are just stitched on top (see pics below comparing markers on Nati Elves, Girasol Earthy Rainbow and Didy Agave). 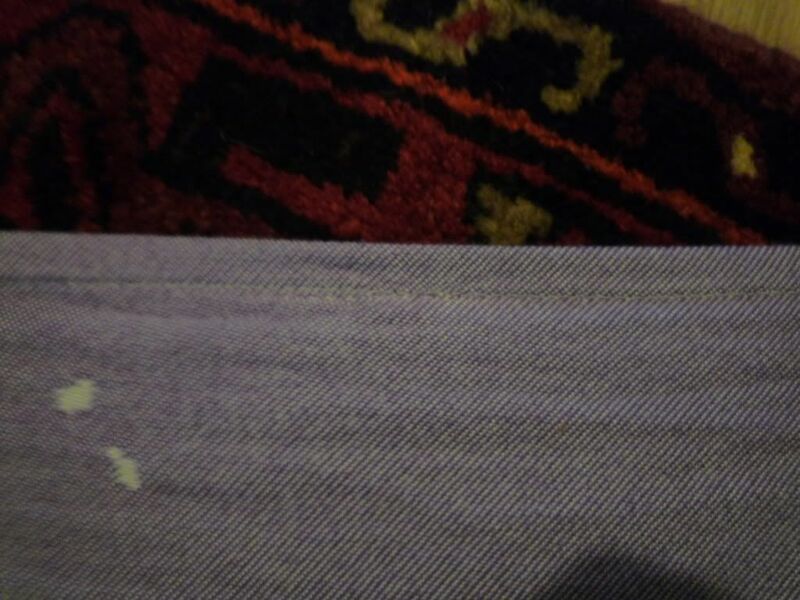 Since I’ve cut my wrap near to the markers (see pic below), I’m going to unpick the few inches of rail hem to get them out before I hem the ends. We’ll be putting them back on later, so I’m keeping them safe. Pin the rail hems back into place – you can either sew them back down now, or sew it all together later on, which is what I’ll do. I did the size 1 shorty first. 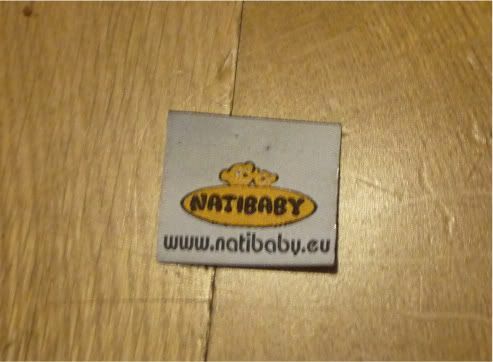 This one was from the end of the original wrap without the label/washing instructions, so currently has no label. To solve this so I still know what brand wrap it is, about 3/4 of the way along I’ve pinned in one of the Natibaby middle markers. This one will be used as a no-sew ring sling and so won’t need a marker in the middle. 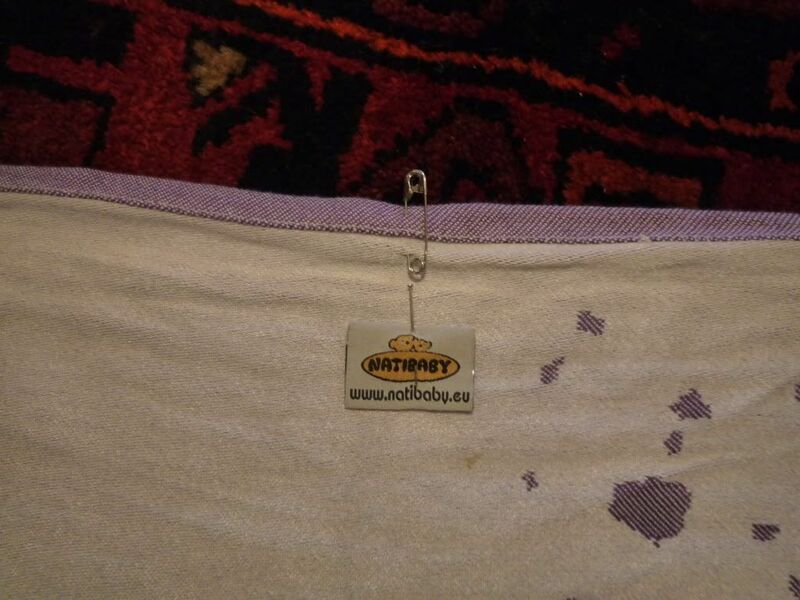 Now you’re ready to sew. I try to get similar colour thread to what was orginially used on the wrap, but I don’t stress about this – it’s really not that noticable if it doesn’t match exactly (as long as it’s not completely contrasting). 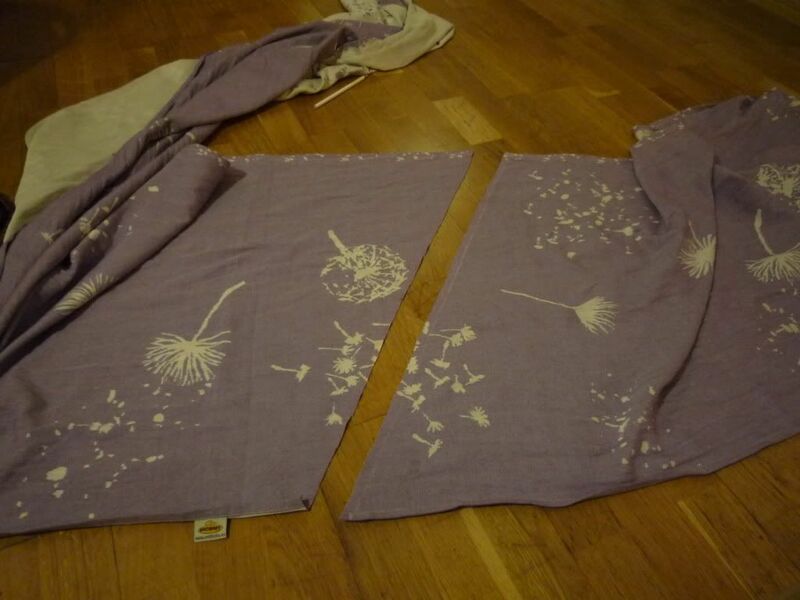 I also do a stitch test on scrap fabric to try to match the stitch length, as this changes from wrap to wrap too. 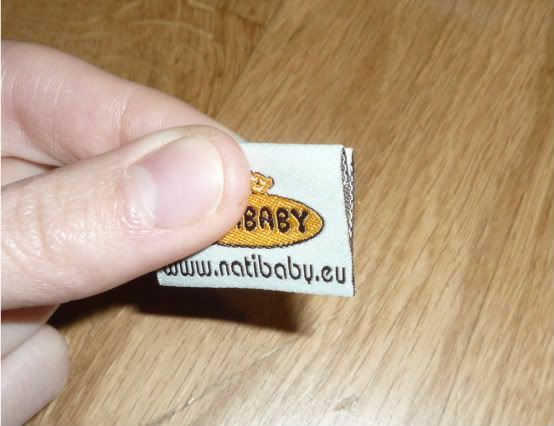 Average stitching is about 2-3mm long. Again, it doesn’t really matter, and if in doubt, go slightly shorter as that’ll be more secure. 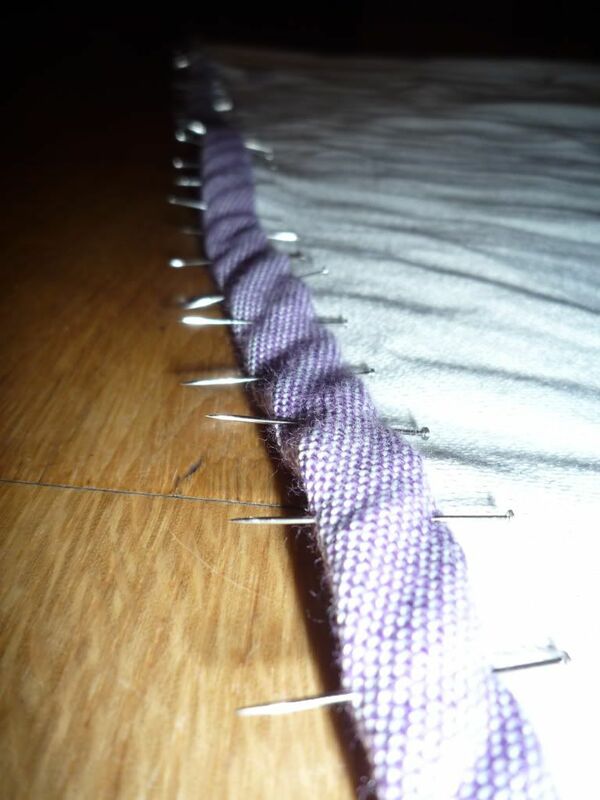 Start by sewing a few cms, then leave the needle down and turn the whole thing around and go back over your stitches. At the edge again, leave needle in and turn. Now sew all along hem, about 1-2mm from the first fold (about 9-10mm from the new edge of the wrap), taking out the pins just in front of the needle as you go. 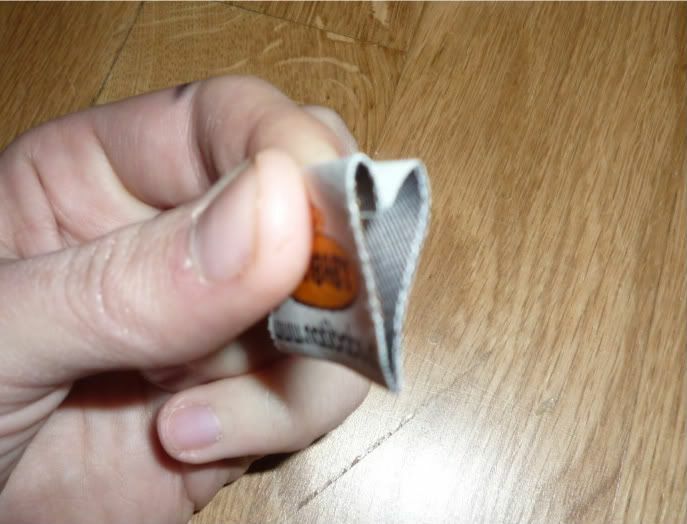 At the other end, go back for a few cms and then sew off the edge. Cut threads. For the wrappable (size 2) piece, it would be useful for me to be able to quickly find the middle for doing ruck carries on the go. So I’ve got the 2nd middle marker that I took out of the rails. 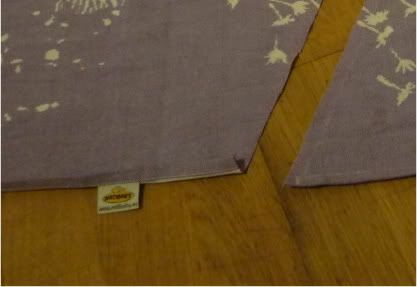 I folded the raw edges of this into each other (see pic below), pinned it and will hand-stitch it just under the middle of the hem of the top rail of my wrap (though it’s useful when tucking the wrap under DD’s bum, I don’t really need a marker in the bottom rail). I’m hand-stitching so that it doesn’t show too much on the ‘right’ side of the wrap, and will use a double-thickness of thread to make sure it’s secure. 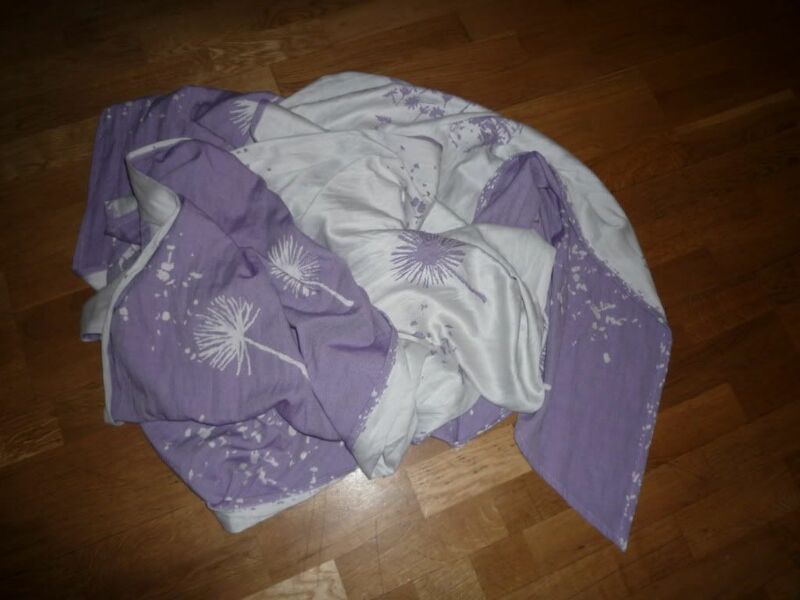 To find the middle of the wrap, fold approximately in half and lay on the floor. Adjust until the two pointy ends are equal (see pic – one of my points curled up for the photo, but I had matched them up to the same line on the carpet to make sure they were equal). 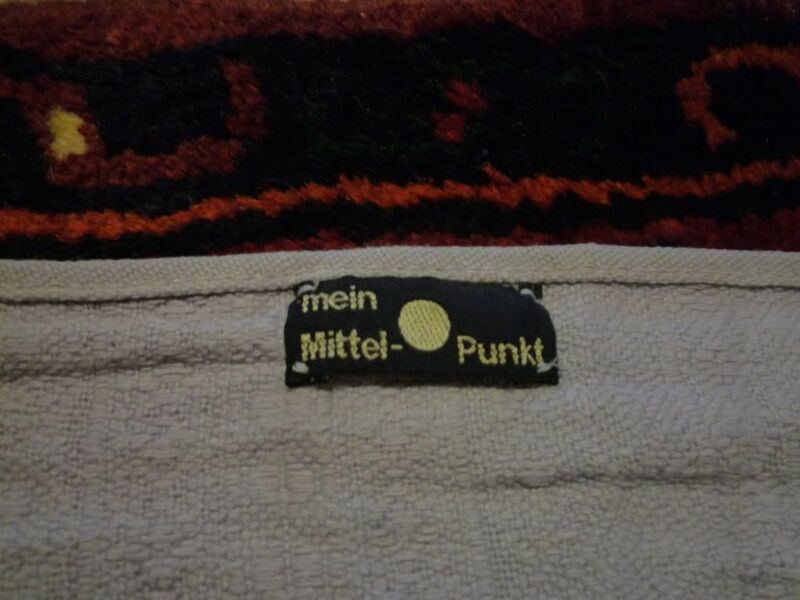 I then marked the middle of the top rail with a safety pin. 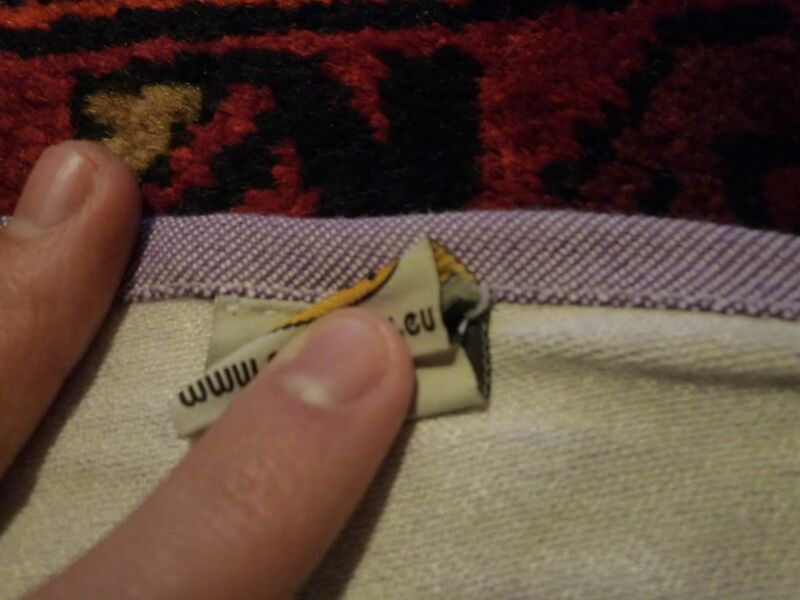 Hand-stitch across once, and knot the ends of the thread inside the folded label to hide them (I’ve tried to show this in the pic – hope it’s clear!). Finished! Here’s what it now looks like on the ‘wrong’ (label) side, and on the ‘right’ side. I’ve also now chopped the hemp indio into a size 1 (230cm) and a size 3 (328cm). 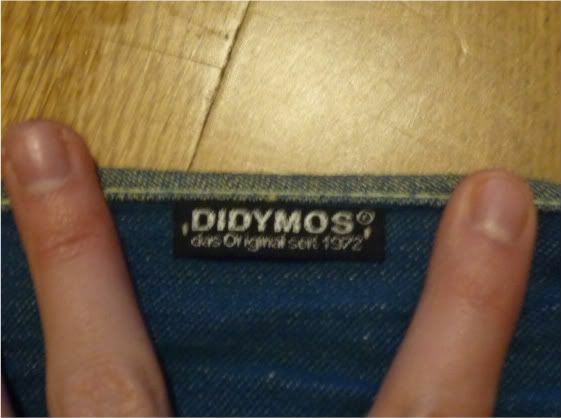 As mentioned above, Didymos middle markers are just stitched on top of the wrap under the hem (see pic), so are much easier to move than Nati’s. 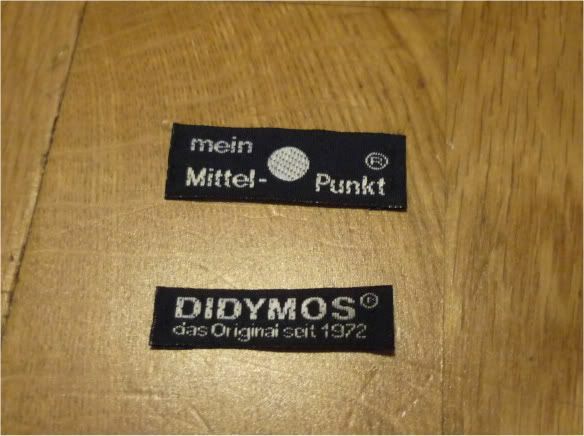 I put the ‘Didymos’ one onto the size 1 wrap piece without a washing label (as with the Nati above), and sewed the ‘Mittel’ one onto the middle of the size 3 wrap. 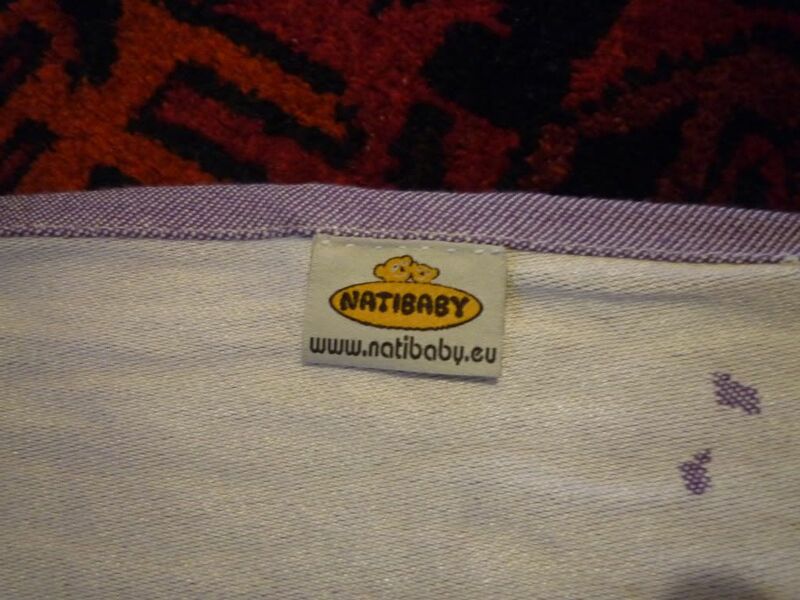 This entry was posted in Babywearing Projects, Sewing & Altering and tagged chopping, didymos, hemming, natibaby, no sew ring sling, ring sling, ruck under bum, shortening, shorty, wrap. Bookmark the permalink. 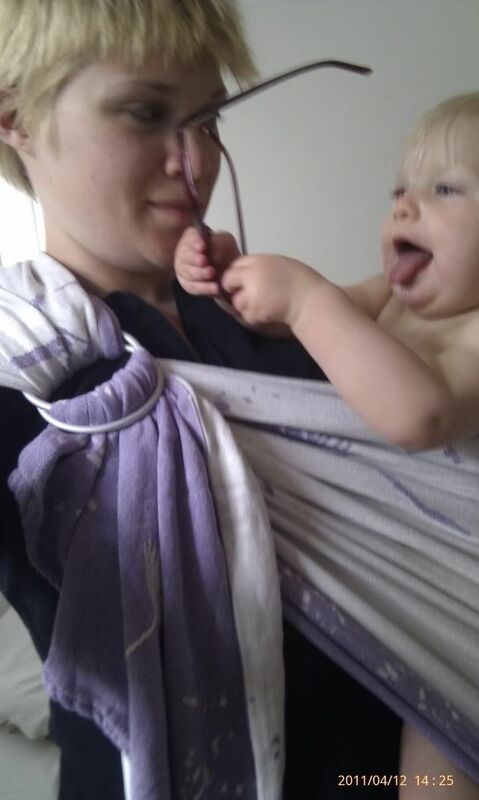 UPDATE: Loving my new shorties – the dandelions ring sling is fab for keeping in the car and looks lovely, and the size 2 makes the most comfy ruck-tied-under-bum (I think because it’s so soft on the shoulders + wide to support my long DD kneepit to neck). Great for carrying a teething baby while trying to be crafty!